Never ones to be scared of change, Blink-182 have revealed they are aiming to have a new album out this spring. And to throw a big curveball at us, they are working with none other than Pharrell Williams on the record. Blink-182 drummer Travis Barker recently made the reveal in an interview with Front Row Live Entertainment while at the Musink Music Festival this past weekend. 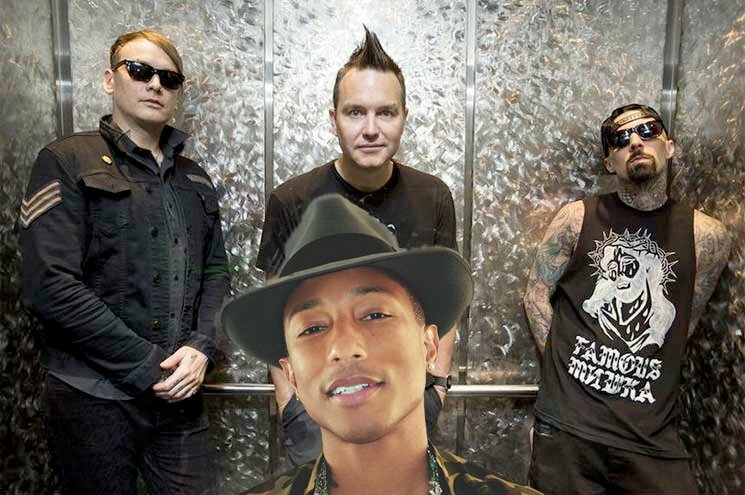 "We just worked with Pharrell on the album," said Barker of the as-yet-untitled Blink-182 album. "We've also worked with this other producer called the Futuristics, which is like a team. So it's kind of anything goes — it's the same vibe going on as we had with self-titled [from 2003]. Literally, anything goes. And I think we're creating one of the most important Blink albums." And if Barker is to be believed, we can expect the album out sooner than later, as the drummer said the LP would "definitely be out before the Warped Tour." As previously reported, the Warped Tour is celebrating its 25th anniversary this year, and Blink-182 are playing the Atlantic City stop, which takes place June 29 and 30. "It will definitely be out before the Warped Tour," Barker said. "I think we'll be finished up right after the time we play Back to the Beach." The Back to the Beach festival, meanwhile, takes place on April 27 and 28 in Huntington Beach, CA. Check out the full interview below with Travis Barker below, and stay tuned for more info on Blink's new Pharrell-equipped album as it becomes available. Blink-182's last studio album was 2016's California.